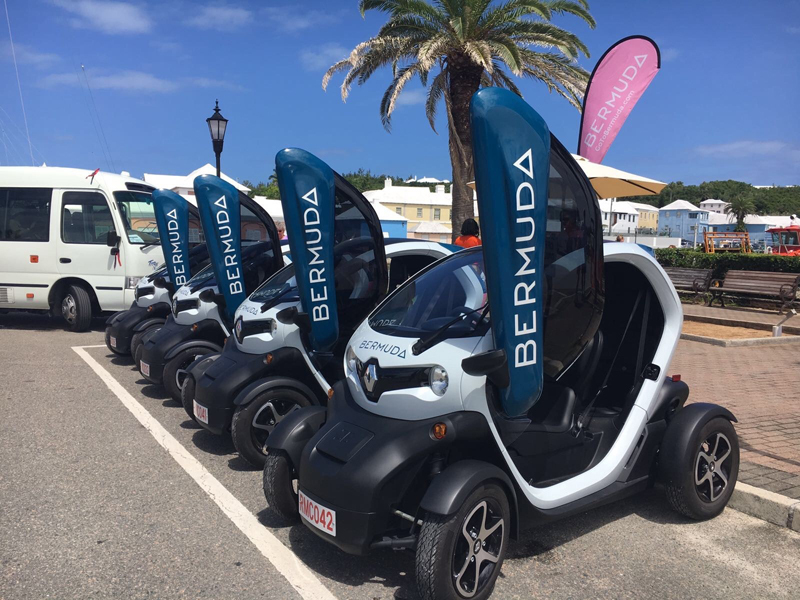 Six charging stations are to be installed at the Royal Naval Dockyard so that Twizy drivers can get a free electric top-up. And the West End Development Corporation [WEDCO] is also discussing opportunities with other electric car operators to see if more charging stations can be installed in the area. “One of the issues we have found is that different makes of electric cars have different types of chargers,” said Joanna Cranfield, the Business Development Manager at WEDCO. She said WEDCO tried to be as environmentally conscious as possible, but also wanted to help locals and tourists who wanted to take advantage of new transport options. Meanwhile, a pilot recycling programme, which started last year on a six-month trial at Dockyard, is doing “very well and is an extremely popular addition”. “WEDCO had teamed up with the Department of Public Works to enable the recycling and we are both monitoring is as we progress but are pleased with all the results to date,” said Ms Cranfield. Interesting and laudable WEDCO, just a few questions. As these electric top-ups are being offered FREE how long will this last, is BELCO providing this Free electricity or is it solar based? While it may be good PR for WEDCØ to offer free top ups for electric vehicles I wonder why they do not offer free fuel for the rest of us after all this can only be viewed as an enducement for EV users to visit Dockyard. Do they value less the visits by the rest of us? Other jurisdictions around the world also offer free power for electric vehicles in a bid for cleaner alternatives, this is not something new. If you read the article, they clearly state this is motivated as being environmentally friendly (along with the recycling program they have ongoing) which is an initiative for people to move AWAY from fossil fuel. So why would they promote free fuel if they’re trying to get you to give it up? See now there is the advantage of the internal combustion engine. You can get instant energy at any gas station. Even get a bottle worth which works right away if you run out.